Can't make up your mind which to buy? Why not pop everything you like into your shopping basket and make your final decision when checking out by unticking the boxes of the items you don't want to buy today. Payment: You can pay by PayPal or by credit or debit card via PayPal (you don't need a PayPal account to do this) or via Nochex. 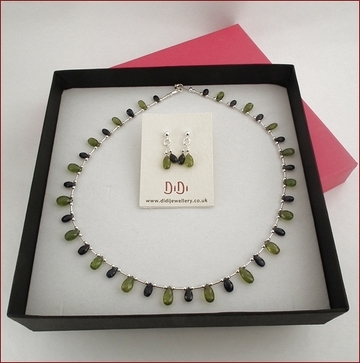 (Please note that the name Nochex will appear on your statement, rather than DiDi handmade jewellery). Or, you can pay by cheque (UK customers only) or bank transfer. If paying by cheque, please make it payable to Didy Ward and post within 7 days of your order and ensure you have included your cheque guarantee card details and address on the reverse. Delivery address: If you pay by PayPal or NoChex, they will take your address details and that is the address I send things to. If you want your items sent to a different address you can change the delivery address in PayPal and that will come through to me. If you pay by BACS or cheque you can give the address you want your items to be delivered to here on the website. Or you can just drop me an email! Returns: If you are unsatisfied with your purchase, please let me know by email (info@didihandmadejewellery.co.uk) within 7 days of receipt and return the item(s) to me, unworn, in their original packaging. I will then issue you with a refund to cover the orginal purchase price. Postage costs are not refunded unless the item is faulty. I advise you to use a "signed for" delivery service, as I cannot refund items which do not reach me. For hygiene reasons this offer does not extend to earrings. Refunds are issued within 14 days of receipt of the returned item. Exchange: If you wish to exchange an item for something else, please let me know asap which item you would like in return and send the item back to me within 7 days. I will reserve the item you want to exchange your item for for 7 days and until I receive the original item back. If it is returned in its original packaging and unworn I will post the new item to you the next working day. If the new items is of a lower value than the original I will refund the difference. If it is of a higher value you can send a cheque for the difference when you send back the original item or I can issue you with a PayPal invoice. PLEASE NOTE: I do allow some leeway if the item is a gift, so the 7 day rule is from when the recipient receives the item, rather than from when you purchased it, up to 28 days from the date of purchase. Any exchanges after 28 days are at the discretion of DiDi handmade jewellery and no refunds will be issued after 28 days from date of purchase. Repairs: In the event of any piece of jewellery arriving damaged or broken, or it it breaks during the first month after purchase I will happily repair it free of charge - even if this has been a gift for someone else. (And don't forget, I also offer a repairs service for other broken jewellery too!). Alterations: Should you find, when you receive your necklace or bracelet, that you would like it slightly longer or shorter, just let me know and send the item back to me and I will make the necessary alterations. .Alterations may require a small additional charge if I need to source extra gemstones or silver or gold components or the alterations requires a redesign to the necklace or bracelet. But I always do what I can to make the jewellery just what you want without any extra cost. Commissions: I love helping customers realise their own jewellery design ideas and am happy to accept commissions. As this usually involves sourcing just the right gemstones and silver and gold components I ask for a non-refundable 50% deposit in advance. I often email ideas for approval before completing the jewellery, so the customer is involved as we go along. Once the jewellery has been completed I email photographs of the final piece and, once approved, send an invoice for the remaining 50%. Commission pieces cannot be exchanged as they are unique to the customer and may not be resaleable but adjustments can be made before the jewellery is finally sent out. Once you have placed your order you will receive a confirmation email and I will post your order on the next working day. If you have any queries at all I will be more than happy to answer them. My full contact details are on the contact page. All of my gemstone jewellery is unique - there is only one of everything as all of my jewellery is handmade. If you like the look of something on my website but would prefer it in a different stone or a different size, or with a slight tweak to the design, please do get in touch and if I have the stone in stock, or can easily obtain it, I can make a piece especially for you. Alternatively - if you have a design of your own that you would like me to make up for you then I would be happy to discuss with you how I can interpret it for you. Sadly I'm not yet in a position to do any silversmithing work - still waiting for my outhouse to be turned into a studio! Orders will be posted by first class post on the next working day following your payment. Postage on jewellery repairs: I will offer you a choice of payments: signed for delivery (£4.50 in the UK) or guaranteed delivery (£7.50). I recommend guaranteed delivery. DiDi handmade jewellery cannot take responsibility for any repaired item sent back by any other method than guaranteed that might go missing. All jewellery is wrapped in handmade acid-free tissue and sets of jewellery are sent in boxes similar to the one shown above, securely wrapped inside the box and well wrapped to withstand the post.